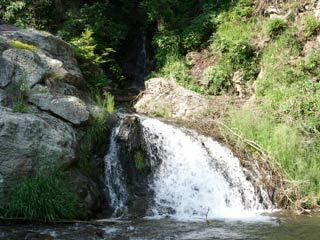 Sengo Falls (千古滝) is located Ueda, Nagano prefecture. It is two 5m high waterfalls. Legend said famouse one of "Sanada Juyushi( 真田十勇士)," 10 Ninja of Sanada, Kirigakure Saizo trained his hiding technique here. Because this waterfalls exist for long time with a mysterious atmosphere, poeple made many legend such as Dragon, or Kappa. This waterfalls was enshrined Benzaiten. So, people used pray for raining. In 1844, people built Onsen because there was hot spring around this waterfalls. That is called Fujimi Onsen, and today, its Onsen still exist next to this falls.